Ananka's Diary: Is This a Face You Can Trust? I wanted to have a groundhog day party, but my friends blushed, whispered to others that I was mentally damaged, and shook their heads. Anyway- MA always has more winter than we deserve. It's all the weatherman's fault! Our winter here JUST started, I mean, we had NO rain until 2 weeks ago, then there was the 'biggest storm in 100 years' (according to the weatherman, who, like the groundhog, I do not trust)It was really cool though! Last year the groundhog said early spring, but we got a lot snow in may!! Haven't you guys read the thing in The Empress's Tomb about how to predict the weather?? once the weather man said there was gonna have a hurricane. And NJ hadn't had a hurricane in like, several hundred years ago? I actually missed the snow. NEVER TRUST THE WEATHER MAN! Well, if you look "meteorologist" up in the dictionary, the first definition is "evil genius," the second "criminal mastermind," and only the last " weather scientist." For some reason this post cracked me up. I was seriously laughing my head off. I think it has to be Evil Genius. in winter the only thing that happens here in winter is a gloomy sky and 2 much rain. i can't stand it anymore. wait, they have groundhogs in a zoo? as in, the place with the cool animals like parrots and polar bears and not the overgrown squirrels you can easaly see in your backyard? I DO NOT TRUST THE WEATHERMAN. i was going to go snow-tubing, but the weatherman said it would rain so we had to cancel. I WILL NEVER FORGIVE THAT LITTLE OVERIMAGINATIVE, VACATION-RUINING, NINCOMPOOP. grounhogs are ginormous squirrels? that makes me very uncomfortable. i now have the image in my head of jabba the hutt the squirrel...which is basically a groundhog. interesting. 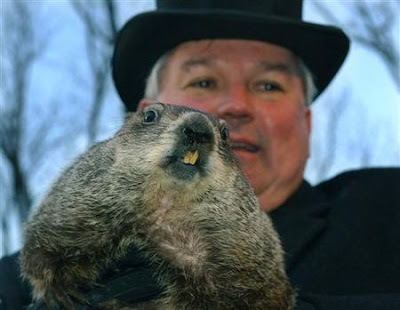 xD Groundhog conspiracy theories... Gotta love 'em! Okay I did the last three posts months ago but me and my girls finally got a blog! I still don't trust him!